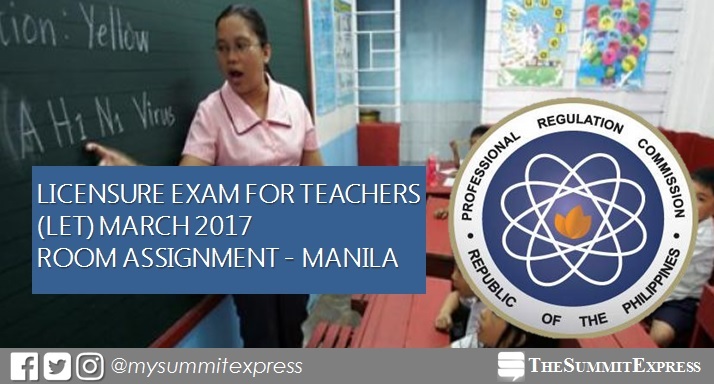 The Professional Regulation Commission (PRC) Manila now released full list of room assignment for takers of March 26, 2017 (Sunday) Licensure Exam for Teachers (LET) in Metro Manila (NCR). On Tuesday, March 14, list of room and school assignment for elementary and secondary level (Agriculture and Fishery Arts, Biological Science, English, Filipino, MAPEH, Math, Physical Science, Social Studies, TLE and Values Education) were made available online. March 2017 LET will be held simultaneously in the cities of Baguio, Cagayan de Oro, Catarman, Lucena, Puerto Princesa, San Jose (Occidental Mindoro), Cebu, Davao, Iloilo, Legaspi, Tuguegarao, Rosales, Tacloban and Pagadian.